This policy document is aimed at enhancing the opportunities for under-represented groups in FIG with particular focus on gender, youth and minorities. They do not specifically deal with substantive issues relating to access to land or rights for these groups which are discussed in other FIG publications but are more concerned about strengthening the role and participation of these groups within FIG and in its activities. The policy document has emerged from the work of the FIG Task Force on Under-represented Groups (1996-2002) and continuing work of the Joint Commission Working Group 1.5 on Under-represented Groups in Surveying. They are a result of consultations and the efforts of a number of experts and contributors, led by Gabriele Dasse of Germany, as credited at the end of this document. This policy document is comprised of four sections and good practice approaches. Thus, the first section provides the introduction and a statement as to why FIG is committed to enhance the participation of under represented groups in its activities. 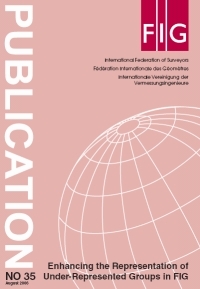 The second section identifies FIG’s interest in gender participation and its policy responses. The third section deals with the under-representation of youth/students and minorities in FIG. In the fourth section, recommendations of the Task Force are outlined. Good practice approaches from around the world are provided as an appendix. 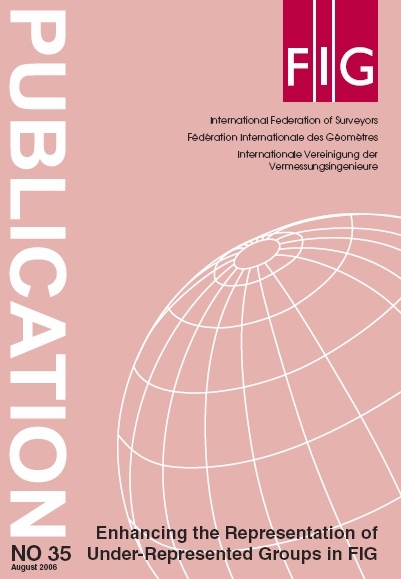 FIG has undertaken several initiatives, such as the quarterly newsletter promoting the participation and perspectives of women, youth and minorities, demonstrating its increasing commitment to diversity in representation and plurality in perspective. However, it can learn from case studies from surveying organisations around the world which provide good practices in this respect. In this section, examples of good practice from professional associations, public institutions and universities from a number of countries across the globe are showcased. It is not intended to be a representative sample, but rather a collection of experiences from countries in which FIG representation has been easy to obtain. ACSM Student Chapters have been encouraged by the association at colleges and universities to support young people and new entrants to the surveying and mapping professions. Students also receive discounted membership fees, and discounted registration fees for conferences. ACSM offers several college and university scholarships in a variety of areas. In the recent past, some scholarships have been designed by ACSM’s Forum for Women in Surveying and specifically targeted to women students. To assist employers in finding well qualified candidates at the entry level, ACSM offers a career fair, which notifies students about job openings. ACSM’s Forum for Women in Surveying produced advertising guidelines for professional and technical publications to help eliminate discriminatory advertising in trade journals and exhibits. The Forum has also produced guidelines for professional and technical writing to help eliminate gender bias in technical and professional publications. ICE has created an Equal Opportunities Committee (ICEFLOE) to promote differing backgrounds, skills, and abilities in the association. ICEFLOE has produced fact sheets and articles about flexible working, age discrimination, ethnic minorities, disabilities, and bullying. To increase awareness of equal opportunities, ICEFLOE has (1) conducted a photo exhibition about real people in real careers, (2) arranged publicity about engineering and construction careers in women’s magazines, (3) participated in an employers’ forum on age discrimination, (4) sponsored radio coverage about engineering careers, (5) reviewed disability access in key locations, (6) held on-line debates, (7) provided speakers for schools, and (8) held workshops and receptions. ICEFLOE prepared a Diversity Monitoring Form for active members of the association to help reduce obstacles to equal opportunities. ICEFLOE also monitors ICE practices and policies. In order to research the need for equal opportunities and to reduce obstacles to equal opportunities, ICEFLOE has prepared a Skills Shortage Questionnaire. To support and encourage members of the association, ICEFLOE has provided personal responses to members’ inquiries, and sponsored awards for diversity awareness and enhancement. ICEFLOE has also collaborated with several other engineering and physics organizations, and with societies of non-English speaking engineers, and with engineers of various cultures. ASCE seeks to promote the understanding and appreciation of diversity, particularly through its Committee on Diversity. The Committee was created to promote the proactive inclusion of various backgrounds, skills, and experiences to enhance opportunities within the profession. The ASCE committee has prepared links to diversify resources, programs, and tips. Included are tips for women and people of colour to engage others in diversity awareness. The committee has prepared lists of leadership skills, and links to e-mentoring programs. As part of its outreach initiative, the ASCE committee has promoted the spread of diversity awareness to accreditation organizations for university and college programs in engineering and technology. To support women in the surveying profession and within the association, DVW established a Working Group "Women in DVW" in 1989. After seventeen years of work the Working Group now has a broad acceptance and is supported financially by DVW. The Working Group is linked to German Commission 1 “Profession”. "Women in DVW" built up a women’s network in the field of the surveying profession and organises several activities during the annual INTERGEO, the German national congress and international trade fair, to promote and support women: "Women in DVW" is represented at the DVW booth in the exhibition area during the INTERGEO, which offers a good opportunity to get in contact with female and male colleagues. During several congresses "Women in DVW" arranged panel discussions and presentations with female aspects, for example "How to establish an Enterprise" or "Reform of the Curriculum at Universities.” The network built up a database for mentoring. An annual weekend-workshop of "Women in DVW" was created to increase the network and to prepare all activities. DVW determined guidelines in 2005 to support students and young professionals in preparation for governmental services. Within the frame of financial resources, DVW finances entire or partially for example the participation at seminars and congresses or for semesters or diploma thesis in foreign countries. Students fees for congresses and seminars as well as membership fees are subsidised. At the University of Cape Town in South Africa (UCT), a number of measures have been adopted to counter the imbalances perpetuated by apartheid and previous colonial systems which have led to various groups being underrepresented in the profession, including Black people who are in the majority in South Africa. One of the approaches is affirmative action as seen in the South African experience. Persons from underrepresented groups are actively “recruited, trained and developed to compete equally and contribute to the development of the company”. The process of implementation of affirmative action should be completed within a specified time period and should not be continued indefinitely. Proactive approaches and resources are needed to address problems faced in affirmative recruitment. Affirmative recruitment in the survey industry is hampered by poor skills/academic base of school-leavers – racially skewed in favour of the white population group due to historic apartheid education discrimination. There is a great shortage of persons from underrepresented groups who are suitably qualified for professional positions. Recruitment and retention of such persons is thus a great problem and lack of commitment to an employer results, often with the non-white/female surveyor job-swapping frequently chasing after the highest salary. A highly successful support programme has been running for many years for students from educationally disadvantaged backgrounds. This programme adds another year to the degree programme (which is usually 4 years) and is based on high contact levels with students, assistance and mentoring with all aspects of the transition to University, and additional academic tutoring. Some students from rural areas have never ridden a bicycle, seen or used an elevator, and may never have ridden in a passenger car. There are many challenges in teaching highly technical subjects to those who have potential, but have had very little exposure to technology. Some of the students from this programme have gone on to be among the top performers in the Faculty. The programme at the University of Cape Town, as well as the local branch of the Institute, has endeavoured over the past years to be as inclusive as possible in social functions. Such issues as finding sponsorship for alcoholic as well as non-alcoholic drinks at functions, catering for different food preparation requirements such as Halaal, and making sure that activities include women on an equal footing to men, are areas which have improved. Increasingly, organisations involved with Geomatics are becoming conscienitized to such issues. To address the inadequate gender ratio in its courses, the School produced a promotional video "Make your Mark". The translation of the School video by means of dubbing into languages other than English is another possibility. The video represents a significant milestone in attempts to improve the number of females in non-traditional areas of study. In the surveying industry, this is the first video specifically targeted towards this objective and was funded by a Curtin University Equity and Access grant and serves to internationally recruit the best persons available while adhering to Equal Employment Opportunities (EEO) guidelines. The School also rewards the efforts of EEO target groups and conducts an annual prize giving ceremony awarding prizes for special achievement. This is a project, founded by the equal opportunity officers of four universities of applied sciences (FH) in the Northwest of Lower Saxony, Germany, in 1993: FH Oldenburg, FH Osnabrück, FH Ostfriesland and FH Wilhelmshaven. It is funded by the Ministry of Science and Culture in Lower Saxony. The project organises one week Summer Schools for girls ages 16 and up to encounter natural sciences and engineering. The concept is to offer hands on experiences as well as lectures, guided tours and panel discussions with positive role models: female students and practitioners. In some Summer Schools Job Shadowing or Worksite Tours are also made possible for the “practice students”. In addition special 2-3 day courses on selected subjects are organised during spring and fall vacations, e.g. geoinformatics, physics, mathematics and environmental engineering (especially active in developing this module.